Without you knowing, your attic and crawl spaces are hosting an array of microbes, insects and small animals that decided to turn these sensitive areas into a place they can call home. In order to get rid of these creatures quickly, you’ll need an experienced team that knows what to look for, and how to remove these threats before things get out of hand. A through cleaning is mandatory in these sorts of situations, and we’ll make sure that the process will be carried out quickly and efficiently. But first things first, call us today to book a free inspection of your property. 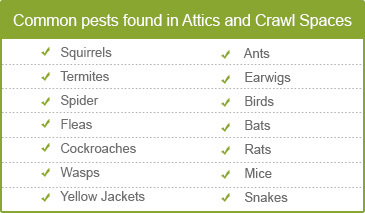 There is a range of hazards that can be lurking in your dark attics and crawl spaces. Termites breed rapidly and can quickly eat through woodwork and supporting beams. Small animals like birds, bats, rats, mice, rodents make homes in the neglected attic and crawl spaces, and they eat into wiring, ducting and insulation with their razor sharp teeth. Inflated electric bills due to damaged insulation and air ducts. Urine and feces of these small animals are highly contaminated and it also fills the area with foul odors. Extreme humidity caused leaking ducts can lead to growth of harmful mold and mildew. Dangerous gases and microbes start to thrive in humid areas of the attic and crawl spaces. Quartz Solutions has the latest equipment to ensure that each inspection that we make is accurate. Creatures such as insects, microbes, pests and animals living in your attic and crawl spaces will get flushed out and carefully removed. Our team will also identify leaks, damaged insulation, broken ducts and much more. Out inspection is free of charge, so don’t stay in the dark about the condition of your attic or crawl space, call us today and schedule your appointment. 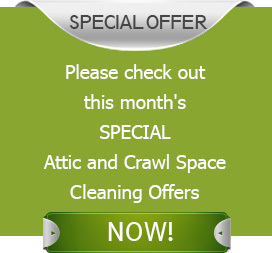 Fair price is the value offered by Quartz Solutions for attic and crawl spaces cleaning. Our rates are extremely competitive and we can beat any offer. Paterson, the third largest city in New Jersey, is home to nearly 149,222 people. The area is often termed as the Silk City because of its silk production output and its pretty outlook. This county is part of the Passaic region, needs to preserve its beauty. We at Quartz Solutions promise to help this community keep their homes decontaminated and healthy. Get our free inspection now!